In two prior IM-Home posts (here and here; one reproduced at the CreativityPost blog), I suggested that the requirement to quiet my unquiet or busy mind, via controlled focus on the IM auditory feedback cowbell tone, might be similar to the sense of being "in immediate awareness" as described by those who meditate. Furthermore, I hypothesized that both IM and meditation training might be training the mind to silence the ever-present random self-talk of the default brain network. By silencing this network, it becomes possible to attain singular focus on a stimulus or immediate experience. The constant wandering of our minds, which can be focused on both positive and negative thoughts and ideas, can be trained to disappear by invoking certain executive functions (our personal brain manager) and high levels of attentional control. The video of an experienced meditator watching identical visual images in both non-meditative and meditative states provides clear evidence that the networks of the brain function differently during these two different states. 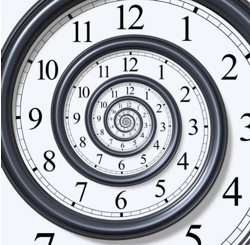 Many philosophical and contemplative traditions teach that 'living in the moment' increases happiness. However, the default mode of humans appears to be that of mind-wandering…and with activation in a network of brain areas associated with self-referential processing. We investigated brain activity in experienced meditators and matched meditation-naive controls as they performed several different meditations (Concentration, Loving-Kindness, Choice less Awareness). 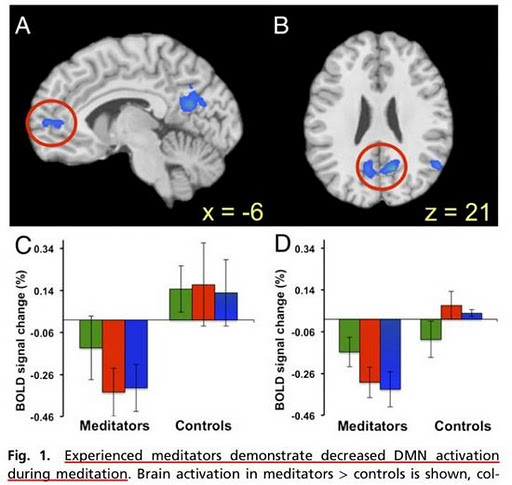 We found that the main nodes of the default-mode network (medial prefrontal and posterior cingulate cortices) were relatively deactivated in experienced meditators across all meditation types…Our findings demonstrate differences in the default-mode network that are consistent with decreased mind-wandering. As such, these provide a unique understanding of possible neural mechanisms of meditation. These authors suggest that we spend approximately 50% of our time in the mind-wandering default mode! As I described in a prior post, I believe that individuals differ in their amount of spontaneous mind wandering, and I am on the high end of the busy mind continuum. For those who want to read the original article, I have provided access to an annotated version via the Brain Clock Blog. This possible IM-meditation connection (suppressing and controlling the default mind wandering brain network) has increased my motivation to continue my IM training. Unfortunately, due to the holidays I have not been able to complete any IM sessions this past week. However, I have discovered that knowing that I can turn my default wandering mind off for brief periods of time (2-5 minutes) has resulted in myself invoking on-demand-focus. This typically occurs when I am driving, a period of time when my mind is extremely busy with a number of private conversations. I remember the newfound skill required during my IM sessions and make a conscious decision to focus only on the immediate task of driving. I can successfully invoke controlled focus for 2-5 minutes at a time. I would like to make them longer, but this is the best I can do now. I am confident that increased IM training will extend the time I can engage in what I call deliberate on-off focus–or on-demand-focus. My confidence in my ability to invoke on-demand-focus has empowered me to use and practice it in non-IM real world settings. In the field of educational psychology, this type of competence-specific confidence is called self-efficacy, a motivational trait that facilitates performance in the domain where the competence is felt. An analogy is the childhood story of the Little Engine That Could… that chanted "I–think–I–can, I–think–I–can"–but in my case it is "I–know–I–can, I–know–I–can." This is the essence of self-efficacy—an apparent indirect positive outcome of my IM training. Furthermore, the fact I am aware of this emerging skill and have confidence to deploy it, indicates that I am "thinking about my thinking,” which is what cognitive psychologists call metacognition. In summary, my personal IM experience and research readings suggest that IM training has similarities to formal meditation techniques. Both methods train the mind to block out mind wandering self-talk and invoke focus in the immediate moment. My success may be partially due to an indirect non-cognitive benefit of IM—increased self-efficacy in my ability to focus and exert controlled attention. What I find exciting is my newfound (yet still not fully developed) ability to invoke on-demand-focus. Having such a mind tool can only facilitate my cognitive efficiency and ability to perform in situations where I need to focus like a laser beam.